If we notice the human world we will find that everyone is trying to get some confort and that confort is normally searched in money because we think every happiness of life can be gain through money only but the human body is having a soul and that soul also needs confort and happiness. So the question arise : What is the source of confort for our soul? The answer is given by Allah himself in the Holy Quran . "The confort of hearts (souls) is in Allah's worship"
Now if we have the answer so why not to come out of that crowded race of earning money and try to gain some comfort for our souls. 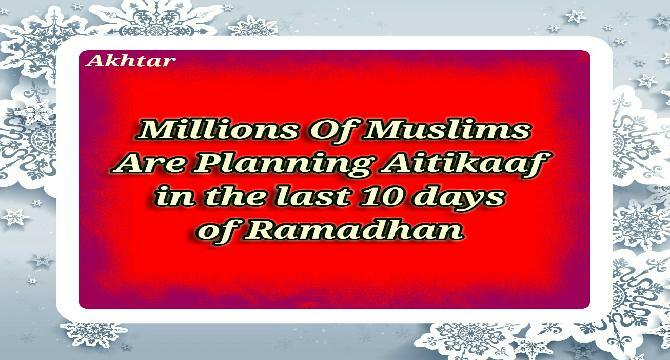 Millions of people does Aitikaaf in the honour of Sunnah of Prophet Muhammad SAW in the last ten days of Ramadhan. Try to be one of them or become a preacher of it to get blessings. May Blessings of Allah be upon you.